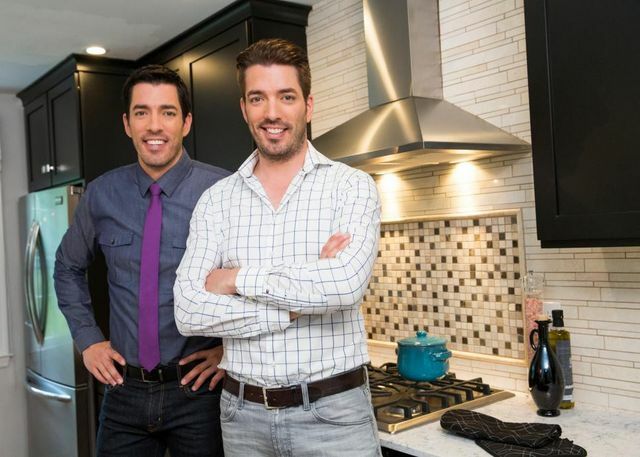 Jonathan and Drew Scott don’t just fix up houses on “Property Brothers: Buying and Selling.” Now that Drew is engaged, they appear to be building relationships, too—and the homeowner in the latest episode of the HGTV hit needs their guidance big-time. In the episode “Shacking On Up,” we meet Neil—a firefighter who’s clinging to his college days by living with his former frat brothers and his huge, rambunctious dog, Maverick, in a house he bought three years ago. All that testosterone has taken its toll on the place: It’s one big man cave, with nicked walls, shredded furniture, and an absolutely abysmal kitchen. The problem is that now Neil is dating Jenna, and they want to take their relationship to the next level, but she won’t move out of her pretty pink bedroom in her parents’ house until he provides living accommodations that are more suited to her taste as well as her pet Yorkie, Brodie. In walk Jonathan and Drew. On closer inspection, Jonathan finds, to his horror, that this firefighter is living in a house that’s a fire hazard. None of the electrical components is grounded, and the whole house will have to be rewired in order to bring it up to code. Despite the home’s painfully obvious flaws, Neil thinks it’s worth $425,000 to $450,000. But Drew has bad news. “It’s only worth $375,000 as is,” he says. Jonathan adds that they’re going to have to spend $35,000 on renovations to make it sale-ready, and $7,000 more to bring the electrical system up to code. Neil is not happy about that, but in the spirit of true love, he decides to roll up his sleeves and go for it. He even gets his buddies from the firehouse to come in and help with the demolition. “If you can survive this reno, you can survive a lifelong marriage. It’s a big test,” Jonathan tells them. Here’s how it all pans out, and what we can all learn about renovations, romance, and everything in between. First things first: The man cave, aka den, is screaming for a major makeover, with its fire-engine-red walls, brown linoleum floors, shredded modular couch, and, of course, a huge flat-screen TV. It looks like the guys have been raucously watching games in there for decades. But Neil and Jenna are in luck! All the fixes here are cosmetic. Jonathan installs the same hardwood floors he did in the rest of the house, paints the walls a soft white, removes the mirrors on the sliding closet doors, and stages it with light, neutral furniture. It’s a big hit. When potential buyers walk in the front door and see ugly linoleum and mud brown walls, they’re going to turn around and walk right back out again, warns Drew. So Jonathan pulls up the flooring in the entry and replaces it with gorgeous patterned marble tiles. He also paints the walls here (and in the rest of the house) in light, airy shades of gray and white. He finds a contemporary crystal chandelier that Jenna says reminds her of the engagement ring she hopes to one day have (hint, hint). The kitchen is an odd box with ugly wallpaper in the middle of the main floor, so Jonathan demos everything, from the floors to the walls to the cabinets, with a little help from Neil’s firefighter friends (after all, they’re used to breaking through walls!). When Jonathan discovers the cabinets he’s ordered will not fit the new ceiling bank he had to install, he improvises and goes with floating shelves. The living room has no character, so Jonathan adds an electric fireplace, which takes up very little space, adds a touch of class, and costs only $350. That’s a whole lot of romantic ambience for your reno dollars! An electric fireplace can bring warmth and character to a room. Does this couple live happily ever after? In the end, Jonathan does such a spectacular job on the renovations that the house ends up fetching $460,000 within days of being listed. And that’s good, because Drew has been showing the couple houses to see if they’d rather sell than stay put. The couple’s wish list is fairly simple: They want a big yard for the dogs, as well as room for the couple to grow together and (hopefully) raise a family. The first one Drew shows them is too small, the second is too big, but the third one, like a fairy tale, is just right. From there, Drew manages to get the owners to bring the price down from right at the top of the couple’s $650,000 budget to $630,000, so now Neil and Jenna can afford to install an electric fence for the dogs in the large, lush backyard.